UPDATE! Thank you to all of our volunteers and supporters for making the 2017 Annual Sale a huge success. 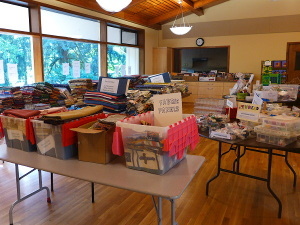 The Coffee Creek Quilters Annual Fabric Sale and Fundraiser is this Saturday, May 27, 2017 8:00 am to 2:00 pm. It will be at St. Francis Church Parish Hall, 8818 NE Miley Rd, Wilsonville (right off I-5 at the Charbonneau exit). Please download our flyer for details.